Ferrari's racing pedigree has been called into question over the last few years, with the team unable to hold a candle to the aerodynamic efficiency of the Red Bull machines. 2014 was supposed to be a game changer with Enzo's famous statement: "Aerodynamics are for those that can't build engines" ringing loudly around Maranello. Unfortunately for the late Enzo Ferrari his beloved scarlet team failed on that front too and now the team have to play catch up on both fronts. The regulations don't really allow for radical new concepts and so each of the 2015 challengers really represent an evolution of what came before it, the SF15-T is no exception. 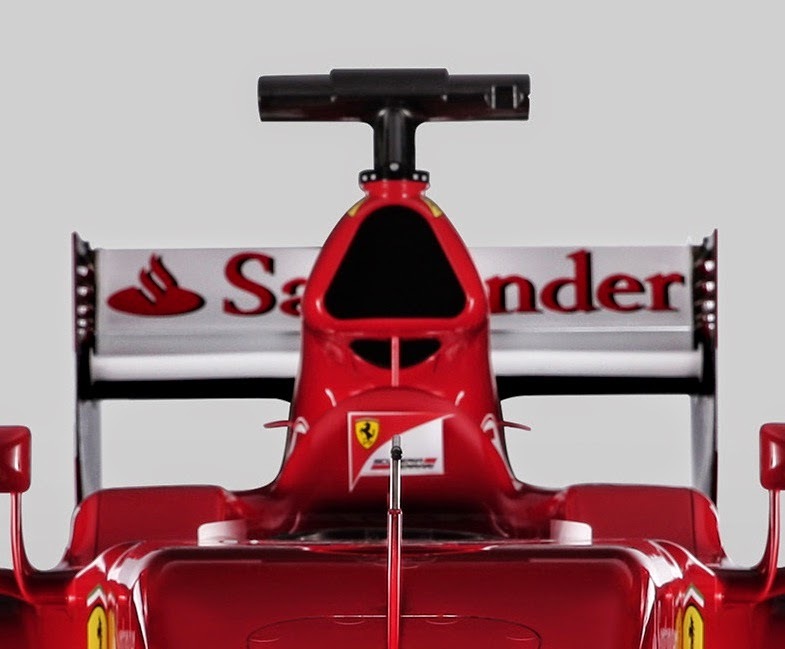 Although Ferrari's 2014 nose design was close to some intepretations of the 2015 nose regulations the team have changed their design, opting for an elongated nosecone that extends over the front wings neutral section. 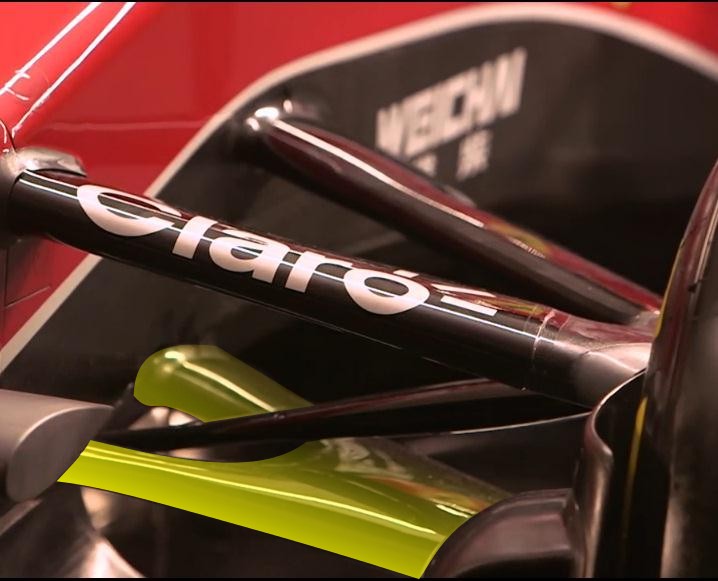 Very similar to the McLaren MP4-30's in shape the nose tip is a wide circular protrusion with very little in terms of height, making the 9000mm2 cross section 50mm behind the tip a letterbox shape. The length when compared to last seasons means that the linear taper from the bulkhead to nosetip prohibits the use of the handlebar style FOM camera mounts, leaving them to be mounted on the side of the nosecone. The pull rod suspension is retained but as predicted by some of my colleagues the team have tried to assimilate the Mercedes conjoined lower wishbone idea (yellow). The idea of which is to reduce the suspension impact on the airflows route to the sidepod/sidepod inlets and how it interacts with the front wing upwash. Underneath the nose/chassis we find a similar set turning vanes the team have run before. The area around the sidepods has become intesely scrutinised over the last few years as teams try to maximise not only cooling performance via the inlets but also leverage an aerodynamic advantage from the sidepod undercut (the shape of which can have an affect on the floor performance), bargeboards, sidepod airflow conditioners, leading edge slats and cockpit fins. In the case of the SF15-T the bargeboards initially caught my eye as they are split in two with the most forward ones (yellow) leading edge leaning away from the chassis, attempting to capture more airflow as it passes by the splitter etc. Meanwhile the secondary bargeboard (green) looks to recover any boundary layer loss that may occur by having a high angle, longer single version. The vertical sidepod airflow conditioner in blue seems outwardly similar to the one used on the predecessor but there are some changes, firstly it doesn't extrude from the cars floor, instead (like the ones run late on in 2014 on the Mercedes W05) it extends outwardly from the secondary bargeboard, clearing the floor of an unnecessary element, making it easier to deal with the floor downstream. The vertical section of the airflow conditioner has seemingly been orientated inward too, much like we have seen Red Bull do before changing how the tyre wake influences this area in yaw. As per its predeccesor the airflow conditioner also arcs over the sidepods shoulder to form a leading edge slat that terminates at the cockpit surround (the team use this as a way of increasing sidepod performance). You'll also note from this image that the sidepod inlet has also been lent backwards (at its base) increasing the undercut and maximising the inlet cross section. The shaped mirror stalks (purple) at present seem unchanged from the F14-T. The sidepods are a crucial design consideration and Ferrari like most last season took several stabs at trying to get this right, perhaps settling in the end for a half way house configuration based on their cooling and aero objectives. The SF15-T's sidepods are an evolution of last seasons design with an emphasis on slimming the coke bottle region and increasing the cooling outlet length to fall inline with the engine cover outlet. Meanwhile the engine cover has undergone a similar evolution with the engine cover slimmed and a larger fin present, whilst at the rear of the car a larger cooling outlet is used to encompass the exhaust and cooling requirements. 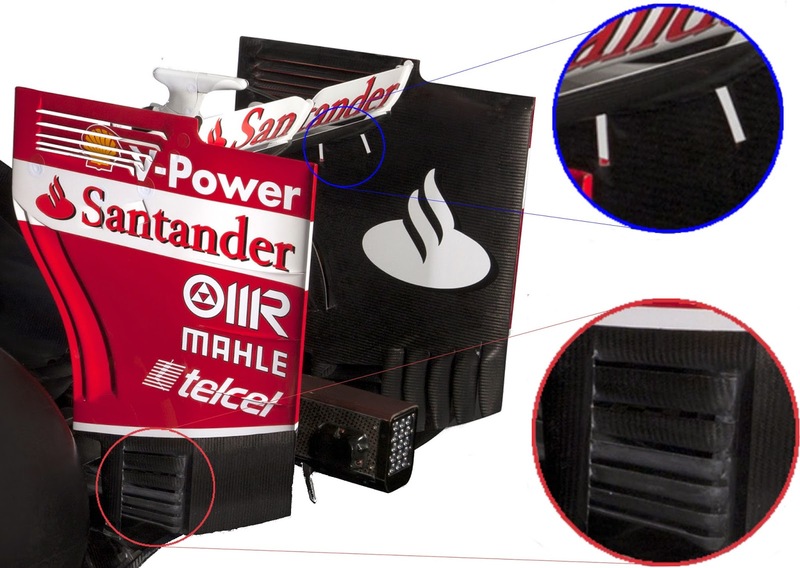 The cooling solution used throughout 2014 that lines the spine of the engine cover is also retained. The airbox has recieved a small update, retaining the trapezoidal airbox inlet shape but adding two much smaller inlets into the face of the roll hoops undercut. Also worth noting from this forward view are the small eyelets either side of the roll hoops headrest which I'd imagine have more of an aerodynamic purpose than a physical. 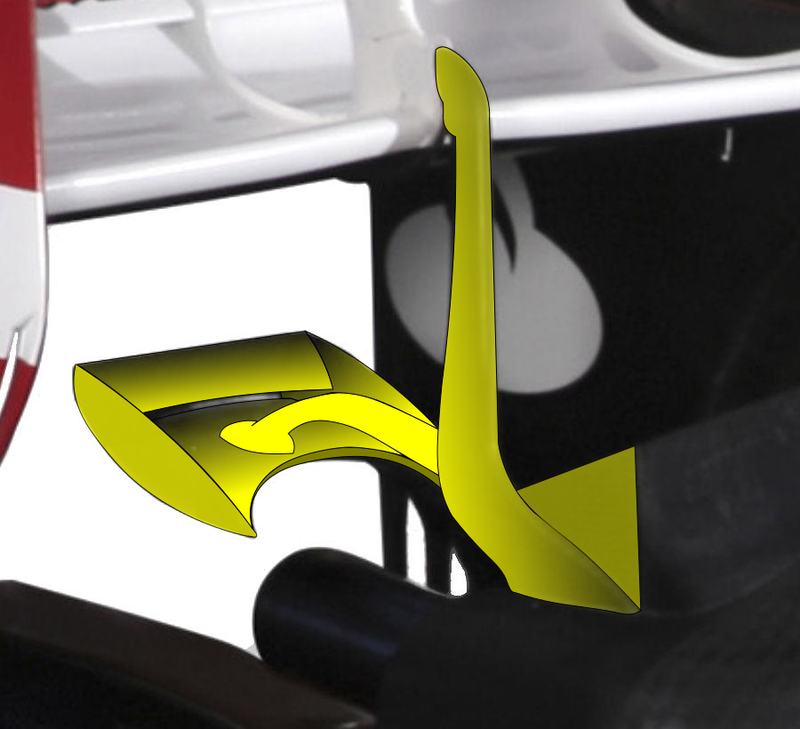 The rear wing is supported by a singular centre pylon which follows the trend the team adopted during 2014, utilising a swan neck connection to the DRS actuator pod, the idea of which is to minimize the disturbance to the underside of the mainplane. Mounted on this we find another swan neck support, this time being used to hang the Y100 winglet off of, its design is fairly similar to one the team used in 2014 but has been altered to enhance how the exhaust plume interacts with the diffuser below and rear wing above. The wedge shape I have highlighted in front of the pylon is fixed to it but is much narrower than the pylon, in order that it matches with the engine cover it butts upto. The rear wing endplates have more holes than a piece of swiss cheese, all of which are designed to utilize the pressure gradients of surrounding air structures and either assist them in generating downforce or reduce drag in general. The blue circle shows the team are continuing to assess the mainplane gradient slots they trialed last season having seen Red Bull use them earlier in the season, in summary they assist the mainplane by allowing airflow inbound, maximizing the wings aspect ratio (especially in yaw). 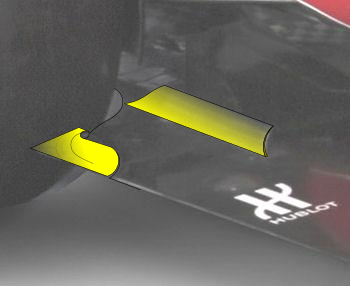 A new solution (red circle) also appears at the base of the the wings endplates, these louvres are placed in a particurlarly sensitive area before the vertical strakes and above the diffuser, suggesting the team are trying to further enhance the upwash from the diffuser. The trailing edge of the endplates also feature a fairly blunt gurney strip, which will of course change how the airflow moves around the whole structure. Some have long called into question the diffuser design employed by Ferrari an area it seems the team have focused some of their attention. 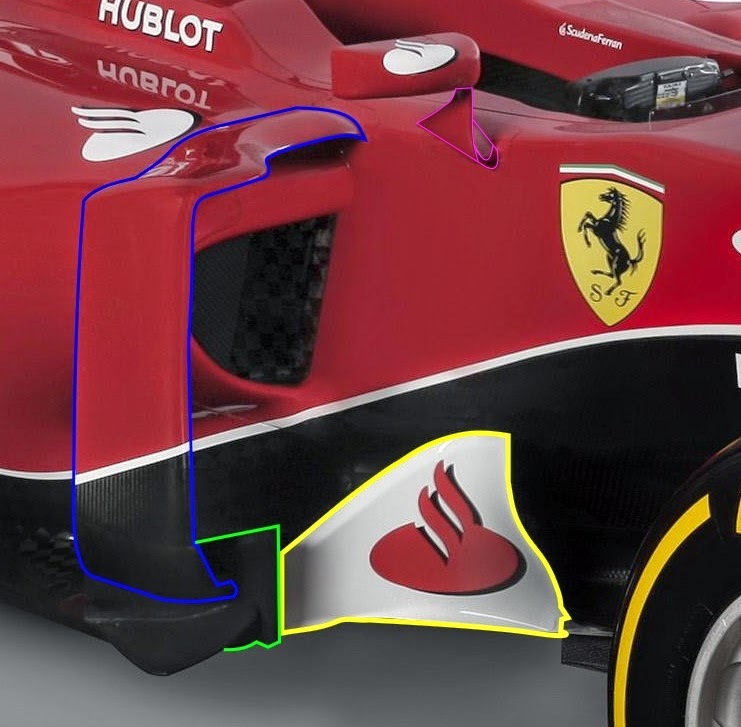 The outer walls of Ferrari diffusers in the past have tended to be quite boxy with only a small radius in the upper corner but as we can see in this image the team have clearly moved toward a shallower outer section much in the same vein as Red Bull's. 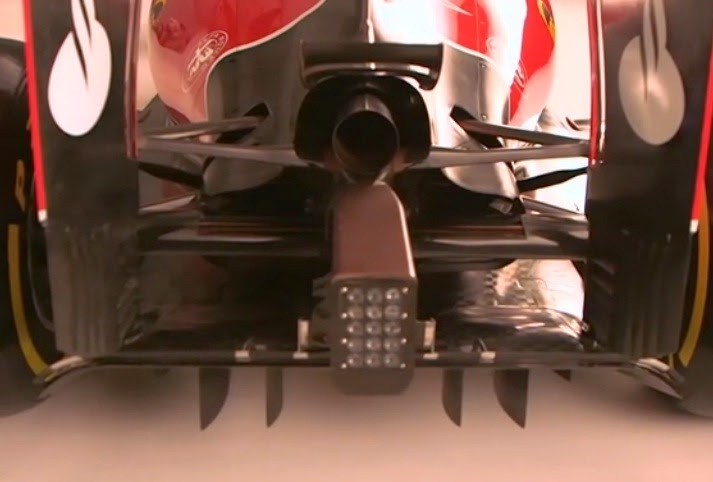 In his video explaining the SF15-T, James Allison talks about the delta between designing with peak downforce (how previous diffusers used by Ferrari could be explained) vs more usable downforce over a wider operating window and it's pretty clear that the changes to the diffuser have been done to cater for this. In the tyre deck area we can see that the team have opted for some changes, a curved vertical strake now divides the section between the the edge of the floor and sidepod, which will roll up the airflow that comes into contact with it. Meanwhile in favour of the teams usual 3 tyre squirt slots ahead of the rear wheels the team have chosen to follow Red Bull, Mercedes and McLaren with a raised dog leg slot. The way these devices condition the airflow in the region is pivotal to the diffusers performance, as invariably they control how the dynamic changes of the tyre affect the airflow. 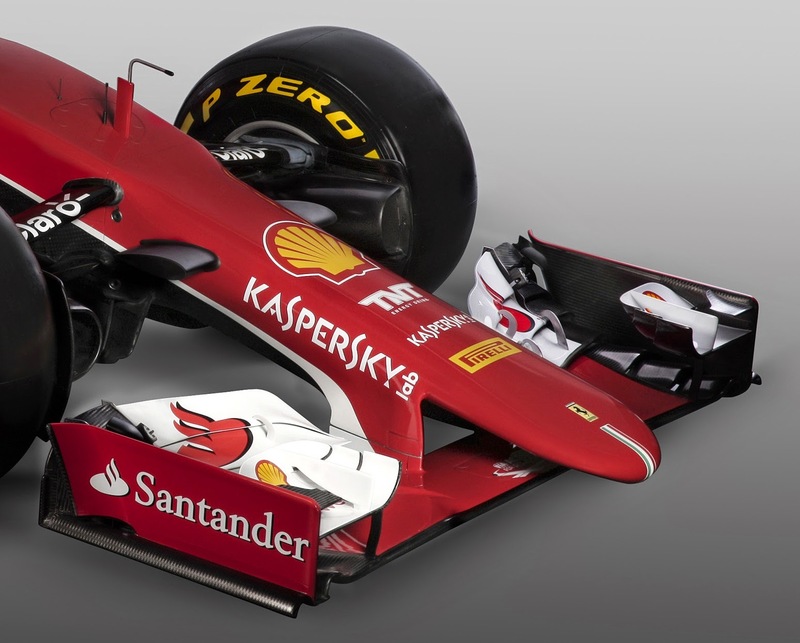 The Ferrari powerunit clearly had some issues during 2014 and so the team are eager to continue developing what they have. The opportunity to spend the development tokens throughout 2015 rather than homologate in February is a short term win for Ferrari, who are clearly behind schedule. "Our objective, in term of tokens, is really to spend only few at the start of the season, to maintain a significant opportunity of developments during the season," Binotto added. "The current 2015 PU has already gain a significant amount of performance, and we will keep pushing during the entire season." This is directly opposed to the route being taken by Mercedes and Renault who will spend the majority of their tokens before the season commences meaning the offset in performance could see Ferrari struggle in the opening part of the season. 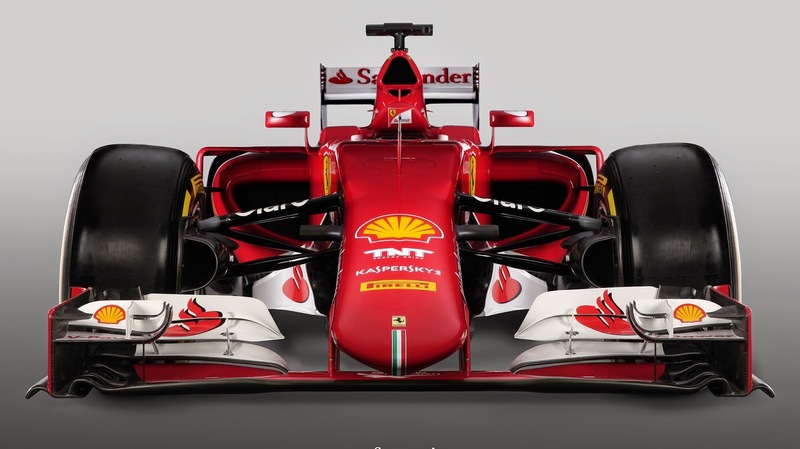 Furthermore with drivers only able to use 4 powerunit during 2015 and a total of 20 (maybe 19 if Germay is lost too) races on the calender it means changes can only be made to the powerunit alongside the scheduled PU change (every 4-5 races) meaning the first time Ferrari will be able to update the PU will be Bahrain/Spain or sacrifice a PU for their driver. As always as this is only a launch piece there's likely to be many changes to the SF15-T over the coming weeks, so keep your eye on the blog for updates. Matt please, what's the difference in adjustment time between Push and pull rod suspension, besides entering point? Thanks! we are Ferrari specialist and Bentley Specialist. that most of our new customers come to us as a result of personal recommendations from our loyal customer base. from minor scratch repair to full resprays.Centrally located in the Midlands just South of Birmingham, on the Hartlebury Estate in Worcestershire, a 10 minute drive from Junction 6 off the M5 motorway. I really appreciate for giving us the information on Car Scratch Repair Dublin panel. My husband's car was damaged a little bit because of an accident. So it needed to be repaired soon.